Angela Georgina Burdett-Coutts, 1st Baroness Burdett-Coutts (21 April 1814 – 30 December 1906), born Angela Georgina Burdett, was a nineteenth-century philanthropist, the daughter of Sir Francis Burdett, 5th Baronet and Sophia, formerly Coutts, daughter of banker Thomas Coutts. In 1837 she became one of the wealthiest women in England when she inherited her grandfather's fortune of around £1.8 million (equivalent to £160,000,000 in 2018) following the death of her stepgrandmother, Harriot Mellon. She joined the surnames of her father and grandfather, by royal licence, to become Burdett-Coutts. Edward VII is reported to have described her as, "[a]fter my mother, the most remarkable woman in the kingdom." Burdett-Coutts was widely known as "the richest heiress in England". She was a great collector of paintings, including many Old Masters. Amongst the contemporary paintings she purchased was Robert Scott Lauder's Christ Walking on the Sea. The Reverend Richard Harris Barham, in a ballad (part of the Ingoldsby Legends) he wrote under the pen name "Thomas Ingoldsby" for Queen Victoria's coronation, referred to her as "Miss Anja-ly Coutts". She became a notable subject of public curiosity, receiving numerous offers of marriage. She inherited the country house at Holly Lodge Estate in Highgate, which was then just outside London, where she was famous for holding receptions. Burdett-Coutts spent part of each year at Ehrenberg Hall in Torquay with her former governess and later companion Hannah Brown, to whom she was devoted. When Brown died in 1878, Burdett-Coutts wrote to a friend that she was utterly crushed by the loss of "my poor darling, the companion and sunshine of my life for 52 years". She was a great friend of both Charles Dickens and the Duke of Wellington, and she proposed marriage to the Duke despite the great disparity in their ages. Three years later, when she was 67, she shocked polite society by marrying her 29-year-old secretary, the American-born William Lehman Ashmead Bartlett, who became MP for Westminster on 12 February 1881. Her new husband changed his surname to Burdett-Coutts. Because of her husband's American birth a clause in her stepgrandmother's will forbidding her heir to marry a foreign national was invoked and Burdett-Coutts forfeited three-fifths of her income to her sister. Burdett-Coutts spent the majority of her wealth on scholarships, endowments, and a wide range of philanthropic causes. One of her earliest philanthropic acts was to co-found (with Charles Dickens) a home for young women who had "turned to a life of immorality", including theft and prostitution. The home was known as Urania Cottage. She avoided taking sides in partisan politics, but was actively interested in improving the condition of indigenous Africans, or the education and relief of the poor or suffering in any part of the world. Though she made no special distinction of creed in her charities, Burdett-Coutts was a notable benefactor of the Church of England, building two churches – including St Stephen's in Rochester Row, Westminster – and endowing church schools. As executor of the will of the Reverend Chauncy Hare Townshend (the author of several volumes of poetry), she, with the Rev. Thomas Helmore (also a poet), used money from Townshend's estate to build a primary school in Westminster, known as Burdett-Coutts & Townshend Foundation Church of England Primary School. She endowed the bishoprics of Cape Town and Adelaide (1847), and the founding bishopric of British Columbia (1857). The granite Greyfriars Bobby Fountain in Edinburgh, with a bronze statue of Greyfriars Bobby, was erected by Baroness Burdett-Coutts. 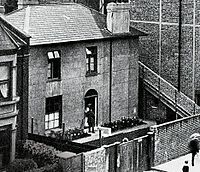 in 1884, she was a co-founder of the London Society for the Prevention of Cruelty to Children, which became the National Society for the Prevention of Cruelty to Children (NSPCC) in 1889; she also founded the Westminster Technical Institute in 1893, and was closely involved with the Royal Society for the Prevention of Cruelty to Animals (RSPCA). Burdett-Coutts founded Columbia Market in 1869, in Bethnal Green in the East End of London, the district where much of her work was carried out. With her project in Columbia Square she became a pioneer in social housing. Through her support of missionary and nursing efforts she was associated with Louisa Twining and Florence Nightingale. Her small housing development, Holly Village, on the corner of what was then her estate, is now in private hands and may still be seen in Highgate. She was also the president of the British Goat Society. The Burdett-Coutts Memorial Sundial, commissioned for St Pancras Old Church, listing the names of many people whose bodies had been dug up from the churchyard to make space for the Midland Railway. In 1871, in recognition of her philanthropic work, Queen Victoria conferred on her a suo jure peerage as Baroness Burdett-Coutts of Highgate and Brookfield in the County of Middlesex. On 18 July 1872 she became the first woman to be presented with the Freedom of the City of London at the Guildhall, and in 1874 she became Edinburgh's first woman Freeman and was also presented with the Freedom of that city. Lady Burdett-Coutts died of acute bronchitis at her home on Stratton Street, Piccadilly. By the time of her death she had given more than £3 million to good causes. Nearly 30,000 people filed past her coffin before she was buried on 5 January 1907 near the West Door in the nave of Westminster Abbey. She left no issue and the barony became extinct on her death. A portrait of her is included in the mural of heroic women by Walter P. Starmer unveiled in 1921 in the church of St Jude-on-the-Hill in Hampstead Garden Suburb, London. Charles Dickens dedicated his novel Martin Chuzzlewit to her and she had many royal and eminent friends. The book Flashman's Lady by George MacDonald Fraser makes reference to her (fictional) love for James Brooke (The White Rajah), and his rejection of her due to his physical affliction. Angela Burdett-Coutts also features in Terry Pratchett's novel Dodger; in an afterword, he states that part of his reason for writing the book was to bring Burdett-Coutts to the attention of modern readers. ^ a b Anderson, John Parker (1912). "Burdett-Coutts, Angela Georgina" . Dictionary of National Biography (2nd supplement). London: Smith, Elder & Co. pp. 259–266. ^ Lewis, Susan (2012). "Appendix II: Bequests and Gifts of Paintings to Angela Burdett Coutts" (PDF). The Artistic and Architectural Patronage of Angela Burdett Coutts (doctoral thesis). University of London. ^ "Brighton's story". Brighton Ourstory. Retrieved 30 August 2009. ^ Russell Brown, “Judgments of Solomon: Law, Doctrine and the Cridge Controversy” in H Foster and J McLaren, eds, Essays in the History of Canadian Law, Vol. VI (Toronto: University of Toronto Press, 1995) 313. ^ "The Victoria or Burdett-Coutts Memorial Drinking-Fountain". The Victorian Web. Retrieved 26 August 2012. ^ "No. 23741". The London Gazette. 26 May 1871. p. 2520. ^ Parsons, Brian (2001). The London Way of Death. Sutton Publishing. p. 46. ISBN 978-0-7509-2539-6. Wikisource has the text of the 1911 Encyclopædia Britannica article Burdett-Coutts, Angela Georgina Burdett-Coutts, Baroness. Owen Rutter, editor. Rajah Brooke & Baroness Burdett Coutts: Consisting of the Letters from Sir James Brooke to Miss Angela, afterwards Baroness, Burdett Coutts. 1935. Professor Jenny Hartley. Charles Dickens and The House of Fallen Women. Methuen, 2009. Charts the history of Urania Cottage. Diana Orton. Made of Gold. Hamish Hamilton, 1980. Edna Healey. Lady Unknown: The Life of Angela Burdett Coutts. Sidgewick & Jackson, 1978. Wikimedia Commons has media related to Angela Burdett-Coutts. "Archival material relating to Angela Burdett-Coutts, 1st Baroness Burdett-Coutts". UK National Archives.